I don’t know about you all, but I couldn’t be more thrilled that the East Coast is getting drenched in inches of cool (read: cold) rain. While at the farmer’s market this Saturday, I overheard that my beloved honeycrisp apples were in peril. I can’t tell you how much I look forward to eating honeycrisp apples by the sackful at the end of summer. We tend to look at the weather with little regard for how it affects all the treats we look forward to eating (like strawberries that I heard will be making an appearance this week at markets), and only think about how we are able to break out our spring dresses early and never have had to locate our snow pants (not that we actually own snow pants in the District). Miserable, rainy days are the perfect ones for trying out hearty and filling recipes. I caught wind of the idea to make a sauce with peppers and tomatoes with spinach from a friend, and after a little bit of planning, came up with a great recipe that is not only rich and warming, but is also 100% vegan. 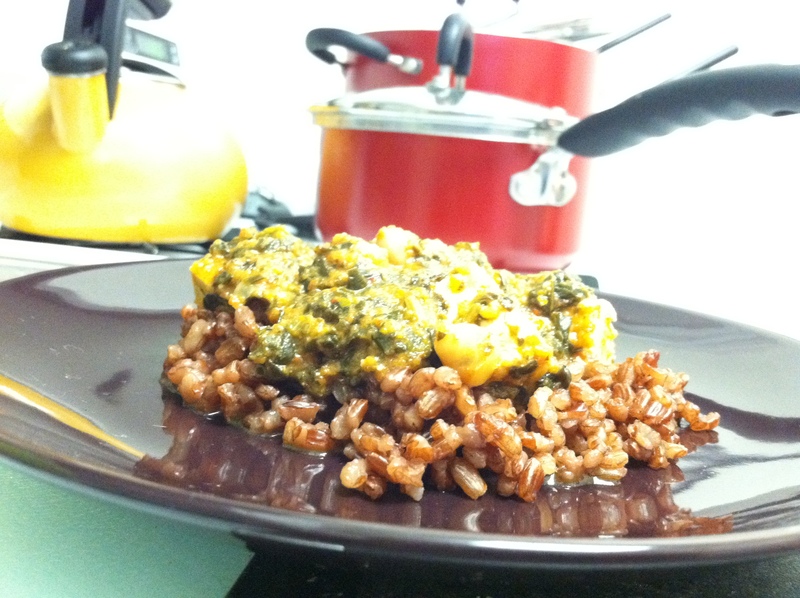 I took the idea of the traditional Indian dish, Saag Paneer (spinach with chunks of paneer cheese), to come up with an Indian/North African scented-dish that might just be one of the best things I’ve ever created. 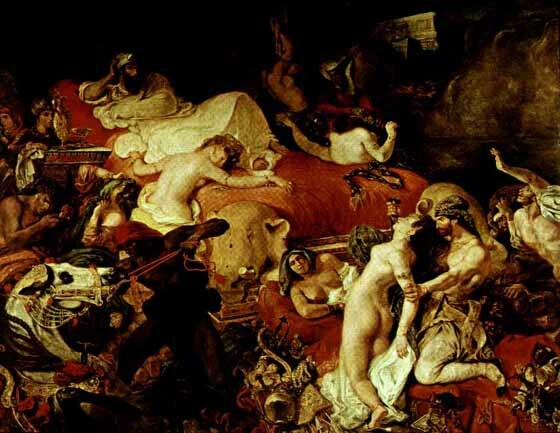 It also made my apartment smell like something from a gorgeous Delacroix — like my favorite Orientalist painting, Death of Sardanapalus. In efforts to try a new grain from the bulk bin at Whole Foods, I picked up some Bhutanese red rice which adds a great nutty depth to the dish. Also, the cashew butter in this recipe gives the stew a rich, full body that makes it taste decadent. In a blender or food processor, puree the peppers, tomatoes, carrots, onion, and garlic. 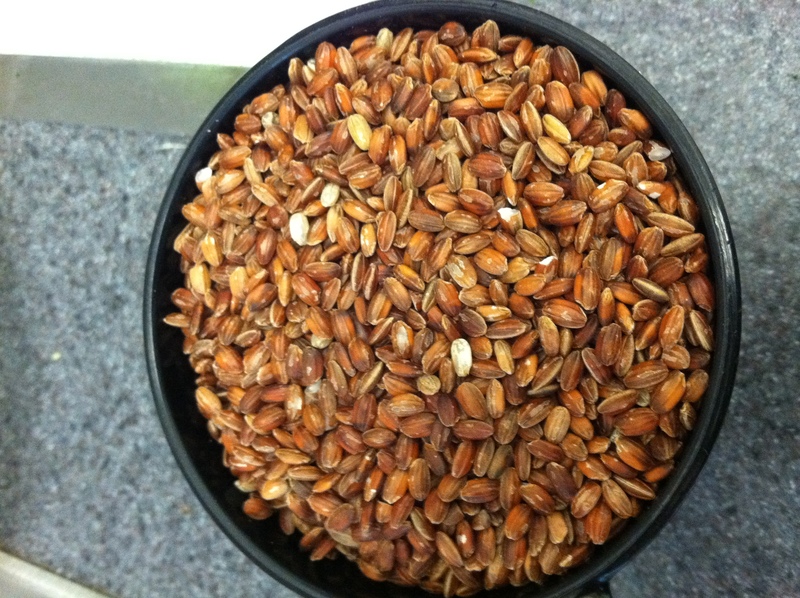 (I had to do this in 3 batches to fit into my food processor.) Pour the sauce into a stock pot. Heat over medium-high heat and add the EVOO and cashew butter, stirring constantly until cashew butter is mixed into the sauce. Add in spices, tomato paste, and about a tbsp of kosher salt (remember to adjust the salt depending on the size of flakes — table salt is saltier bc the particles are smaller) and continue to stir the sauce as it thickens up. Taste the sauce and add additional salt if needed. Drain the tofu and slice into cubes. 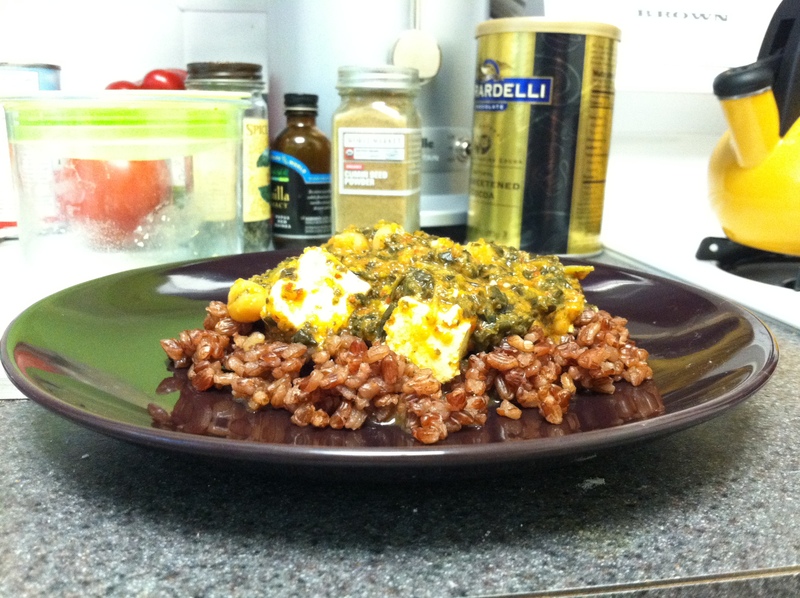 Add the tofu, chickpeas, and spinach to the sauce. Bring to a bubble and turn heat down to a simmer. 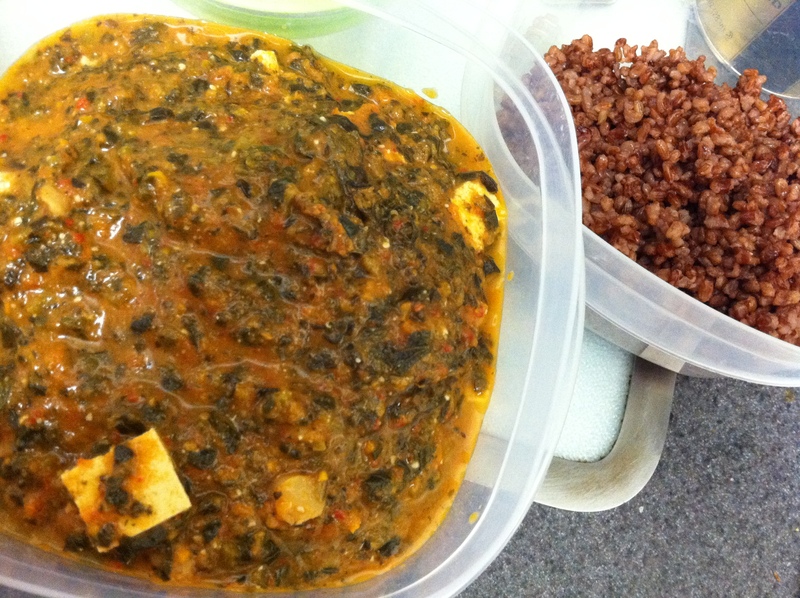 Make sure to taste the sauce after the spinach cooks since the additional water may require increased salt. Simmer for 20-30 minutes. In a medium sauce pot, heat a tbsp. of olive oil over medium high heat. Add the rice. Stir around for 2 minutes. Add in water and bring to a boil. Reduce heat and simmer on low for 30-45 minutes, or until water evaporates. Let rice sit for 10 minutes. Serve the sauce over rice. I hope that you’ll put your food processors and blenders to good use and give this SUPER EASY recipe a try.